I don't see too many people talking about this site. It's not Fivver, that's the one that everyone else is going to tell you about. This one is the real deal. Lets be honest, to get any real work done it's going to cost more than 5 bucks. 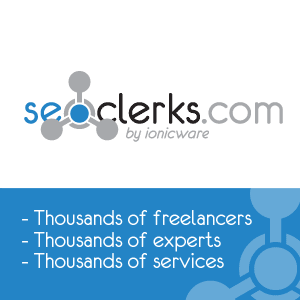 On SEOClerks, vendors can list services for any price they choose. Just like any typical marketplace, each vendor has ratings and feedback, and you can research who you are buying from before you pay any money. Services offered range widly, you can find everything from article writers, to banner creators, to seo services. You can purchase traffic on here, but be extremely careful who you get it from, as most of it is just fake clicks or extremely low quality. However among the sea of listings you can find some gems of really talented people who can do the things you don't know how to or do not want to do, for your business.